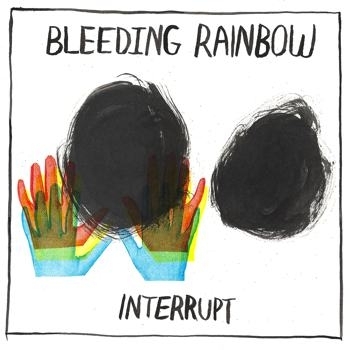 On Feb. 25, Philadelphia's Bleeding Rainbow released their fourth proper long-player, Interrupt, via Kanine Records. If one were to start throwing around superlatives for Philly bands, then Bleeding Rainbow walks away with "hardest working" easily. If not on tour, then they're in the studio and vice versa. Oh, and they hold down day jobs too. After originally starting out as a two-piece known as Reading Rainbow with now-bassist Sarah Everton on drums, the band retooled and expanded, adding another guitarist in Al Creedon. Mis-labled as "twee" in the beginning, but arguably more lo-fi than anything else, Creedon joining the band amplified the band's sonic charge. Last year, they released Yeah Right effectively as a three-piece with no firm drummer in place. 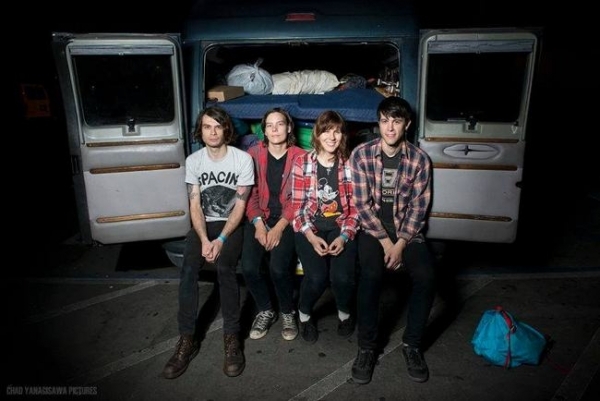 Now 100% a four piece band with Ashley Arnwine behind the kit, the band is on the road once again touring in support of Interrupt. Amidst the busy tour schedule, vocalist/guitarist and original member Rob Garcia took some time to talk to Scene Point Blank. Scene Point Blank: When did you start working on the new album? Was that something that happened while you were on the road supporting the last record? Rob Garcia: Yeah, a lot of this album was written while touring to support our last album, Yeah Right. There were some issues with distribution that pushed back the release date and we already had these tours set up, so we recorded an entirely new batch of songs and self-released a cassette that we sold on tour. A lot of the songs on that cassette were abstract ideas that we solidified further and a lot of that ended up on the album. Additionally, the month before heading into the studio to record Interrupt we were on another tour and used all of our down time in hotels and backstage to hash out ideas and finish writing songs. Scene Point Blank: I saw this come up in another interview, but you guys went on tour in support of the last album and it wasn't a great tour. I just remember seeing on Twitter stuff like "Hey Birmingham, no one's here so come out tonight." or "We're in Madison, and the place is empty." How much did that "strange" tour affect the shape of the new album? It just seems like since that happened the band has employed a more "back to basics" approach. You guys are playing Golden Tea House [a house venue in Philly] and it just seems like more house shows in general. Am I making this up? Rob Garcia: You're not making it up at all. We had a few tours that were just not good fits for us. Either supporting much bigger bands that didn't even sound like us and/or playing venues that nobody in their right mind would go to. All of the frustration that we were feeling was channeled into the new songs. For this album our goal wasn't so much "back to the basics" as it was "get to the point." After touring a lot as a four-piece we were able to understand what our strengths were and how to take advantage of them. Also, yeah, we no longer have a booking agent and the tour that we currently on has been our best one in a long, long time. We are also setting up a full US tour for April/May and we couldn't be more excited. Scene Point Blank: When it came to the new album, was there any one thing that you were hoping to accomplish? Any one direction or anything that you were hoping to cover? Rob Garcia: Our main goal, like I said, was to make stuff streamlined. And that includes the songwriting and also the recording process. For Yeah Right we were still a three-piece when we went into the studio. We didn't really know what we could do or what our strengths were, so we ended up in the studio for like two months. For Interrupt, we recorded and mixed the album in 11 days. We recorded all the instrument tracks live and all of us enjoyed the process so much more. Another goal was to better convey emotions through lyrics and vocal performances too. We wanted to make things immediate and affecting. Recording live also captures that energy which is essential for that type of thing. Scene Point Blank: I've read some interviews with where you seem to take issue with how you're categorized when it comes to genres and what you sound like. What do you think you sound like? What genre would you say that Bleeding Rainbow falls in to (if there is one)? Or are genre labels just mostly irrelevant? Rob Garcia: I think a lot of the time music journalists are lazy. It's really easy to categorize something and then just lump it into a group or throw it to the side. I totally understand that our band could be difficult to describe sometimes, though. But we've also been a band for almost five years now. People develop and grow over time and their interests change and get more complex. But yeah, we kinda hate being described as garage or shoegaze. In the broadest terms, we are just a punk band with heavy psychedelic and pop. Scene Point Blank: Ultimately, how many songs were in the can when it came time to record? Did you just reach 12 and say, "Yep. Time to make the next album?" Or was it more that there were 20 or 30 you had to sift through? Rob Garcia: Haha, it was kinda more like we had 6 songs and initially planned to release an EP, then our label was just like, "Why don't you just write more and put out and album?" So, we wrote 11 songs total and 10 ended up on the album. Scene Point Blank: The band's lineup seems to change from release to release. For instance, Robi Gonazlez did the drums while recording but now Ashley is playing drums. How do you think the lineup changes affect your approach? Rob Garcia: Unfortunately, the lineup changes have been completely circumstantial. While we were getting ready to record Interrupt our friend who was drumming at the time couldn't commit, so we reached out to Robi. We had toured with A Place to Bury Strangers and had become friends. Also, for the type of songs we were writing, we knew his style of drumming would match perfectly. 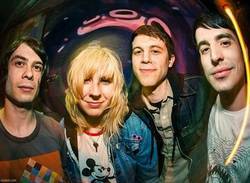 But since he is in A Place to Bury Strangers it was, once again, time for us to find another drummer. We'd been friends with Ashley for a few years now and knew that she was an amazing drumming from other bands that she played in Philly. She was really the perfect match for us as we move forward. Scene Point Blank: Does the changing lineup affect the songwriting process at all? Rob Garcia: The main songwriters have always been Sarah and myself, so it all still comes from the same place. But knowing the strengths of each of the people in the band really helps make the songs more powerful. It also ensures that we don't overextend ourselves by trying something we may not be really suited to do as a band. In general though, we are always pushing ourselves forward and playing what we want to play. "I'm sick of really lazy vocal performances where the singers just sound bored. I'm bored listening." Scene Point Blank: What are your thoughts on the consistency of this present lineup? Is this going to be the lineup for the foreseeable future? Rob Garcia: After so many years of being a band, I feel like we are finally firing on all cylinders. Our live show is the most powerful it’s ever been and we are super tight as a group. Plus we are all good friends, which makes touring so easy and stress free. The present lineup is official official! As soon as we get home from tour we're gonna write a new batch of songs for an EP we'll probably release later this year. Scene Point Blank: With the few songs that have been released thus far, there's been a lot of talk about a new focus on the vocals. Was that a conscious decision to focus on the vocals and clean them up like that, or did it just sort of happen? Rob Garcia: Oh yeah, it was totally a conscious decision to make the vocals stronger. A powerful and emotional vocal performance can be really hard to capture in the recording process, but thankfully from all the touring we've been doing we've been able to gain a lot of confidence in ourselves as singers. We really tried to push ourselves and wanted the have the energy of the vocals match the energy of the music, which I feel like is lacking in a lot of new music. I'm sick of really lazy vocal performances where the singers just sound bored. I'm bored listening. Scene Point Blank: Your live shows lately have been seemingly a mix between older songs from the Reading Rainbow days and stuff off the new album. Is playing those older songs a part of some sort of impetus that influenced making the new album? Rob Garcia: Each new album we've written has been a reaction to our previous album. You learn from what you've done in the past and you use that experience to move forward. It’s been fun relearning those older songs as a full band and hearing what they come out like. Scene Point Blank: What were you guys listening to while recording/crafting the new album? Rob Garcia: While we were working on Interrupt we were listening to a lot of Husker Du, The Replacements, Squirrel Bait, Sugar, Green Day, Nirvana, Glenn Branca, and the Wipers. Words by Chris Brown on May 24, 2014, 3:07 a.m.
Van photo: Chad Yanagisawa. Main photo: Lily Chou. Posted by Chris Brown on May 24, 2014, 3:07 a.m.